Hundreds of police officers across the country supported their Road Policing Division colleagues in a major crackdown on drink and drugs driving last Friday (June 10). 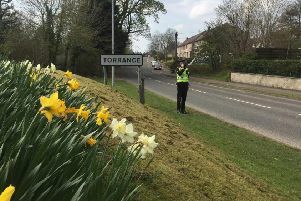 The ‘Local Days of Action’ are part of a two-week Police Scotland campaign, which started last weekend, and combines high visibility patrols and roadside checks to catch those driving under the influence of drink or drugs, or whose standard of driving gives our officers concern. “Our increased visibility and activity throughout the country aims to reassure the public that drink/drug driving is unacceptable. If you choose to drink and drive or drive whilst unfit due to the effects of drugs there is a high likelihood that you will be caught.